Refreshing German Cucumber Dill Salad to serve as a salad side dish during the hotter months of the year. This salad with cucumber is better known as Gurkensalat in German. Gurkensalat is a super popular spring and summer salad in Germany, Austria and all the surrounding countries. The word Gurkensalat itself means cucumber salad (Gurke is a cucumber). How to serve this German Cucumber Salad Recipe? This particular cucumber salad is served during the spring and summer months. People love to serve this cucumber and dill summer salad as a side when they sit outside for food or at a BBQ. It’s quite refreshing! Traditionally, the cucumber salad with the dill salad dressing is served with cooked sweet water fish. Dill herb and fish go hand in hand. In Austria, you will often see cucumber dill salad dressing served with Vienna Schnitzel, Parsley Butter Potatoes, and Lingonberry Jam. Otherwise, feel free to serve up this delicious creamy cucumber salad with a vegetarian or vegan meal. There are some of the more common variations of the German cucumber dill salad. You have the option here to make it the way YOU like it. with fresh or dried herbs – Dill is the most preferred choice or also chives, parsley to just name a few. with the addition of salad oil and vinegar to the creamy ingredient. You can prepare this German Gurkensalat the way you like it. I tend to prepare a cucumber salad with sour cream and dill. I think Austrian cucumber salad is usually prepared with liquid whipping cream while the German ones are made with sour cream. There will be regional varieties of Gurkensalat in the German speaking countries and neighboring countries such as poland and slovenia. I use whatever cucumber I can get from my local grocery store. Seedless varieties are prefered. I semi peel my washed cucumbers for the green peel border effect ( I eat with my eyes too). Then I simply cut my cucumbers into thick slices because I like the crunch. Germans use a manual vegetable slicer to cut the cucumbers thin. So, the traditional way is to cut your cucumbers into thin slices. For the dressing I simply chop the fresh dill herb and mix it into the sour cream and seasoning. The cucumber salad dressing is poured over the cucumbers and I usually do that in advance and not just before serving because I want the cucumbers to take in the dressing flavors. Another idea is to let the sliced cucumbers sit with some sea salt. The sea salt will help in getting excess liquids out of the cucumbers. Then you are left with not adding salt to the dressing. Keep in mind that the cucumbers will loose waters, so if you don’t want liquids but a creamy thicker dressing, simply add the dressing before you serve up the salad. The longer the cucumber slices sit in the dressing the more liquid the dressing will turn. Creamy German Cucumber Dill Salad aka Gurkensalat. You can choose to slice your cucumbers fine (the way they do it in Germany) or to cut thicker slices to add crunch (the way I do it). Rinse your cucumber well and peel. I semi peel mine to add a border effect to my slices when cut. 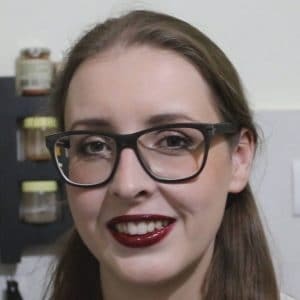 Use a vegetable slicer to cut thin slices of cucumber 9the way it’s done in Germany) or cut into thicker slices with a knife (the way I like it). Keep the cucumber slices in a bowl for a few minutes. Excess water will come out, which you can discard. Pour the dressing over the cucumber and mix. Serve your cucumber dill sour cream salad cooled as a summer side dish with grilled meat or for lunch with schnitzel or steak. 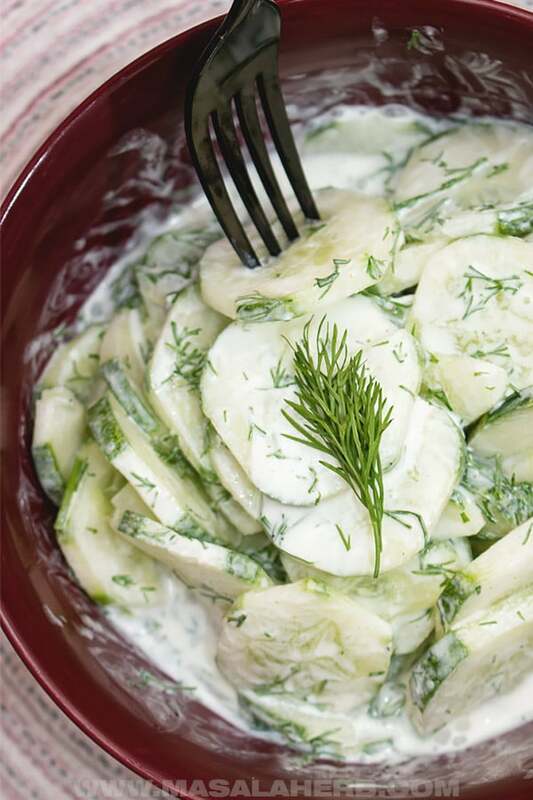 Dear Reader, with what do you serve this Cucumber dill salad recipe? Dear Kat, you have the option to pin a recipe for later to Pinterest. If you don’t use Pinterest, I can recommend “Pocket”, which is a chrome extension and a mobile app. Ratings that have nothing to do with the quality or experience with the recipe are not accepted. I give you 5 stars for dealing with the previous commenter. I removed your stars. Please only rate if you have tried the recipe. 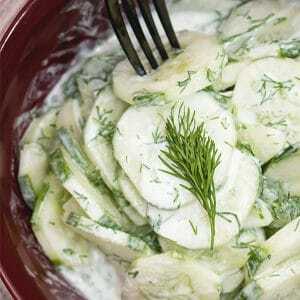 Hi, this may be interesting you: German Cucumber Dill Salad [Gurkensalat]!